Out onto the chilly Atlantic waters and into Iceberg Alley, a boat trip from St Anthony in Newfoundland. After a delicious breakfast at Tuckamore Lodge in Main Brook, we decided to head over to St Anthony and embark on a tour with Northland Discovery Boat Tours. Owned and operated by the Alcock Family, Northland Discovery Boat Tours have been in operation for 10 years and have won several awards for their outstanding iceberg and whale watching tours. This year, the usual pack ice which accumulates in the harbour during winter has been slow to move away or melt with some still blocking the harbour. So, after checking in for the tour, all passengers drove in convoy to the opposite side of the harbour to board the Gaffer III and from where there was a clear channel. Soon, after crew introductions and a safety briefing, we were motoring out of the harbour to the sound of real Newfy music. 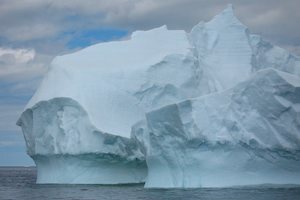 Near the entrance of the harbour, we saw several large icebergs just beyond. These huge slabs of ancient ice looked magical with their jagged, multifaceted edges, glowing blue. No two icebergs are alike and when you ask Paul Alcock whether he ever bores of looking at the bergs - he will instantly tell you "no" and the reason is exactly because ... "every one of them is different and unique". With the experienced Captain Lewis Alcock at the helm, Paul explained how the icebergs came to the coast of Newfoundland, beginning their lives when the glaciers of Greenland calve into the ocean. They then start a two to three year journey from Baffin Bay down the Labrador Coast. On average the icebergs take around 2 months to melt once they reach the north east tip of the Great Northern Peninsula of Newfoundland. Both the icebergs and pack ice form interesting patterns and seem to glow in vibrant colours of blue and green. The colour and intensity of colour depends on how compact the ice is and how many air bubbles are trapped inside. After checking out several icebergs, we headed towards a natural sea cave. Many years ago a glacier, which once covered the area, receded and revealed this natural sea cave which is around 100 feet wide and 170 feet high. Paul has some interesting and true stories to tell of a stranded fisherman and ghosts. The captain soon turned the m/v Gaffer III back towards the St Anthony Harbour after an exciting iceberg watching day, while Paul explained the natural and human history of the area including an insight into the now greatly reduced fishing industry along the coast of Newfoundland.